So you know that Holiday that's coming on Monday? Halloween? Yeah, we love it. 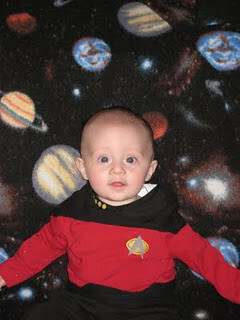 And we have been talking for awhile about what would make the perfect costume for Henry. Once we decided we hit the internet to find said costume, and turns out that it didn't exist. Or it did...but they weren't nearly cute enough for our boy. So I decided I would make it. And when I say "I will make it", I really meant something along the lines of "I will find a picture and my mom or mother in law will make it". Because...well...I am not one for sewing. But then I found a picture (which my mother in law ALSO found and brought to me because it was just that damn cute) and I was like, "You know... I think maybe I want to do this all by myself! LIKE A MOM!" Yeah. 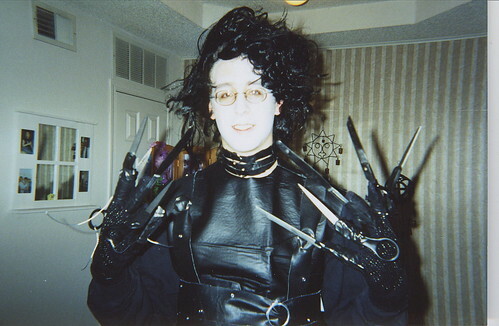 That's Nick as Edward Scissor Hands. Best. Costume. Ever. And I must admit this home made gem is pretty awesome too. And okay fine, we do costumes pretty well around here in general. But these new ones for the babies that we made with our own two hands, they will be on the list of favorites. I can't wait to show you all! Stop by on Monday for pictures of my craftiness.